Mailchimp automatically includes a campaign footer in all template designs. The campaign footer content appears in English by default, but you can edit the content manually to translate it to your preferred language. In this article, you'll learn how to translate your footer content. 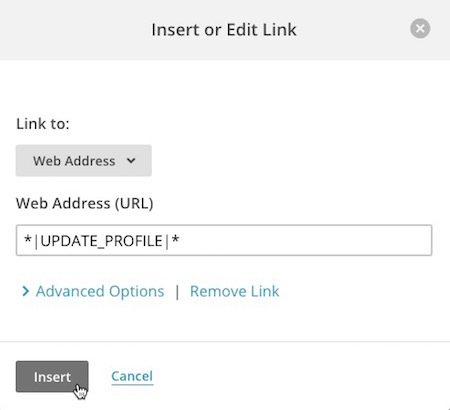 Be sure you're familiar with the Campaign Builder and how to use merge tags in campaigns. The *|UNSUB|* merge tag generates a link in your campaign that lets your subscribers opt out of your email marketing. To translate the link, you'll type the translated text you want your subscribers to see and use the merge tag to generate the click-through link. To translate your unsubscribe link, follow these steps. On the Design step, click the Footer content block to edit. Delete the unsubscribe from this list link. In its place, type the translated text you want to use. Highlight the text with your cursor and click the Link icon in the toolbar. In the Insert or Edit Link pop-up modal, type the *|UNSUB|* merge tag in the Web Address (URL) field and click Insert. 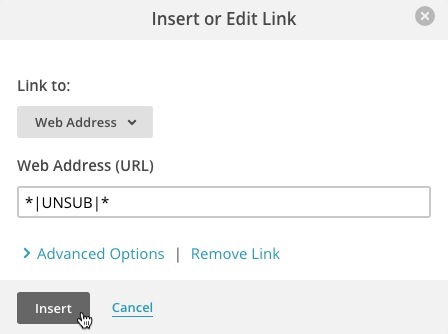 Mailchimp’s default address merge tag pulls in the physical address associated with your audience, and generates an "Add us to your address book" link that subscribers can click to add your information to their address book. To translate "Add us to your address book," you’ll use a different merge tag. To translate the address book link, follow these steps. On the Design step, click the Footer content block. In its place, type in your physical address, or use the *|LIST:ADDRESS|* merge tag to pull in the address from your audience settings. After the address, type 'Add us to your address book' in the language of your choice. 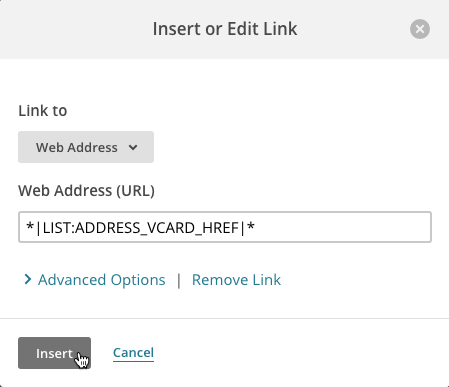 Type the *|LIST:ADDRESS_VCARD_HREF|* merge tag in the Web Address (URL) field and click Insert. The MonkeyRewards badge represents the Mailchimp brand and can't be translated, but you can choose which badge you want to appear in your campaigns. Users on the Forever Free Plan must include the MonkeyRewards badge in all their campaigns. Paid users can choose to add or remove the MonkeyRewards badge in their account settings or in each campaign. The following items aren't required, but it's considered best practice to include them in your campaign footer. A permission reminder is a short message that tells your subscribers why they're receiving emails from you. To translate the permission reminder, follow these steps. In the Remind people how they signed up to your list content box, type the translated text you want to use. The next time you send a campaign that includes the *|LIST:DESCRIPTION|* merge tag, we’ll automatically include the translated permission reminder. An update profile link allows your recipients to update their subscription preferences and make any other subscription changes at any time. To translate the update profile link, follow these steps. Delete the update your preferences link. Type the translated text you want to use. In the Insert or Edit Link pop-up modal, type the *|UPDATE_PROFILE|* merge tag in the Web Address (URL) field and click Insert. Make it easy for your subscribers to forward your campaigns to friends by including a Forward to a Friend link. To translate the Forward to a Friend link in your campaign, follow these steps. On the Design step, click the content block where you’d like the forward link to appear. 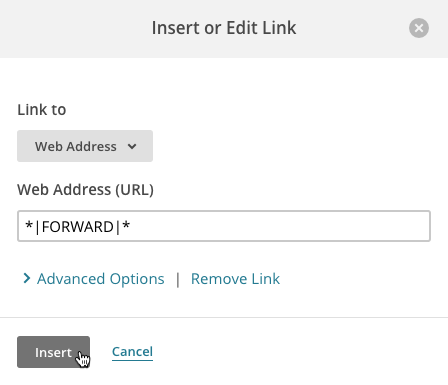 In the Insert or Edit Link pop-up modal, type the *|FORWARD|* merge tag in the Web Address (URL) field and click Insert.